The use of hybrid imaging consisting of single-photon emission computed tomography (SPECT) and X-ray transmission computed tomography (CT) scan has the advantage of providing functional and morphologic information for a given lesion or pathology in a single session. Internet search of PubMed and Google Scholar databases was undertaken. Key phrases searched were SPECT-CT and lesion categorization or characterization. Studies considered for review include a comparison of SPECT-CT versus SPECT scintigraphy, SPECT-CT versus SPECT versus planar scintigraphy, and SPECT-CT in patients with indeterminate lesions on conventional scintigraphy either for benign or malignant conditions. 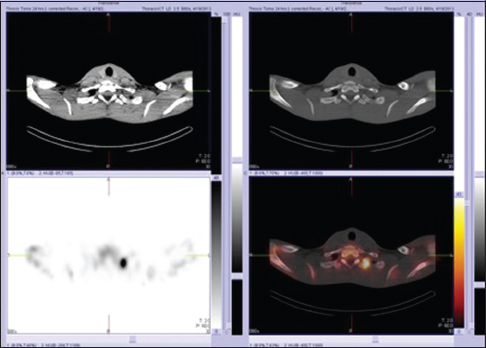 Fusion of functional information obtained from radionuclide imaging with morphologic information obtained from X-ray CT has improved lesion localization, characterization, and observer confidence. It has been shown to change patient management. Background/Aim: Accurate classification of renal size as normal and abnormal depends on precise knowledge of acceptable normal range for the population. 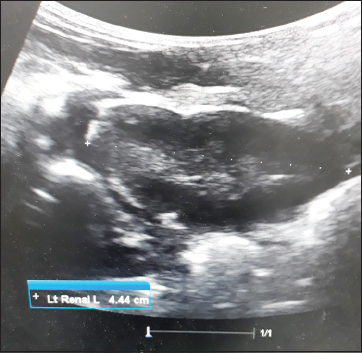 Ultrasound (US) is an excellent tool for defining the norm and imaging neonates suspected with renal pathology because it is cheap, easy to perform, and harmless. Since the kidneys of neonates are distinct from those of older children and there is a paucity of data on normal renal size in neonatal population in sub-Saharan Africa, this study is to determine the normal range of renal size in a large cohort of Nigerian neonates. Materials and Methods: In a cross-sectional study of 528 apparently healthy neonates from two large hospitals in Ibadan, Nigeria, clinical examination and renal US scans were performed in the first 28 days of life. Renal length and width were correlated with somatometric parameters and chronological age of neonates. Nomograms with point-wise 95% reference ranges were also constructed. Results: Mean renal length and width were 4.31 ± 0.50 and 2.03 ± 0.28 and 4.33 ± 0.52 and 2.01 ± 0.31 on the right and left, respectively. Only the mean renal lengths were significantly different between males and females (P < 0.01) and there was no significant difference between the renal dimensions by sidedness. Body weight, chronological age, and to a minor extent, length were found to correlate positively with all renal dimensions. Conclusions: This study of a large neonatal population has provided the normal range of US renal dimensions for neonates in the study area, using the age and weight in plotting the 95% reference ranges for the renal nomogram. Aims and Background: Ultrasound is a screening procedure in suspected dengue fevers (DFs) and other febrile illness in epidemic areas with limited laboratory resources to help in prioritizing patients for emergency critical care. DF has become epidemic in India. 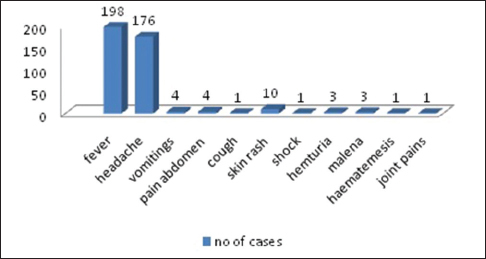 Symptomatic dengue infection with any of the four serotypes of dengue virus can produce systemic and dynamic disease with a broad spectrum of illness with severe and nonsevere clinical manifestations. Subjects and Methods: A retrospective record-based study of 202 cases of suspected DFs were evaluated by ultrasound for a period of 18 months during epidemic in Radiology Department. All age groups were included in the study. Ultrasound of abdomen and chest performed in between 3rd and 10th day of fever. The data compiled by incorporating sonographic findings, clinical findings, and laboratory results. Laboratory data include serology and platelet count. Results: Ultrasound findings were analyzed, in comparison with clinical detection and laboratory results. Eighty-five percent were pediatric age group. 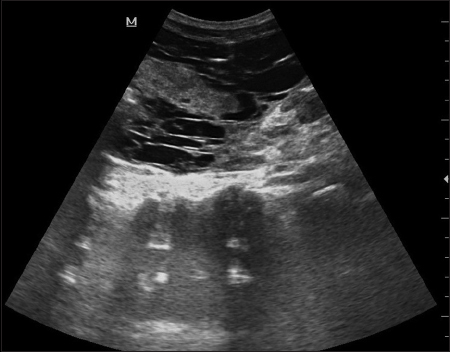 The triad of ultrasound findings is stratified gallbladder wall thickening, 85.2%; ascites, 78%; and pleural effusions, 67.8%. Others are pericardial effusion 2.5%, hepatomegaly 9.1%, and splenomegaly 6.1%. Nearly 18.8% of severe dengue cases were observed. Detection of capillary leakage was 100% on ultrasound and 39.70% on thrombocytopenia. Eighty-six serology positive, 107 with no serology, and 6 seronegative cases were positive for ultrasound. Fifty-five percent isolated gallbladder edema is seen before thrombocytopenia. Conclusion: Ultrasound can be utilized as the mainstay of investigation in epidemic regions with infrastructure shortage. Early demonstration of serosal collection helps to grade DF to severe dengue and prioritize patients for critical care. Background: Diagnostic reference levels (DRLs) were first conceptualized in 1996 by the International Commission on Radiological Protection as a result of wide variations in patient dose levels for the same examination. 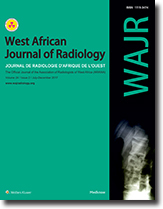 Current works on computed tomography (CT) doses in Nigeria produced significant variations. These observed variations, coupled with unavailable national or regional DRLs have presented the need for the establishment of standards through a dose survey. Objective: The aim of this study is to establish DRLs for CT of the head in adult populations of Anambra State of Nigeria. Materials and Methods: The retrospective survey was carried out from February to June 2016 in the four busiest CT centers. The digital CT population considered was those of subjects examined in 2015, and who were aged ≥18 years. Two hundred folders, comprising fifty from each center were included. 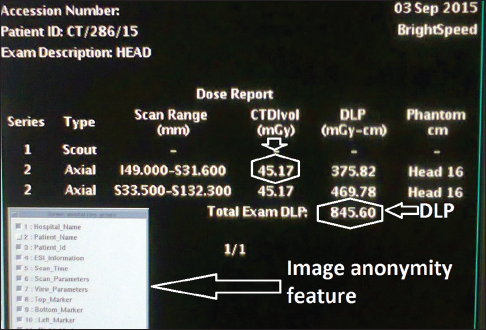 The on-screen volume computed tomography dose index (CTDIvol) and dose-length product (DLP) for the subjects were recorded. The 75th percentile was then calculated for each center to establish center-specific DRLs. Finally, a combined 75th percentile of the CTDIvoland DLP for all centers was calculated to establish the DRLs for the state. Data were analyzed using SPSS version 20.0 (SPSS Incorporated, Chicago, Illinois, USA). Results: The digital folders of 104 male and 96 female subjects with age range of 18–93 years were analyzed. The specific 75th percentile of the CTDIvol and the DLP of the centers ranged from 46 to 86 milligray (mGy) and 794 to 1785 mGy centimeters (mGy-cm), respectively. The DRLs for the State are 66 mGy and 1444 mGy-cm, respectively. Conclusion: The DRLs for head CT in Anambra State has been derived. Although the CTDIvolis comparable to the recommendations of the European Commission, the DLP is significantly higher. Further training on dose optimization may help to bring the radiation dose in the locality at par with foreign values. Background: Gastrointestinal (GI) transit time is a useful diagnostic technique routinely done around the world in human medicine. In veterinary medicine, however, this has only been done in few species in developed nations. With veterinary science, still developing in many parts of Africa, this technique is not routinely done. 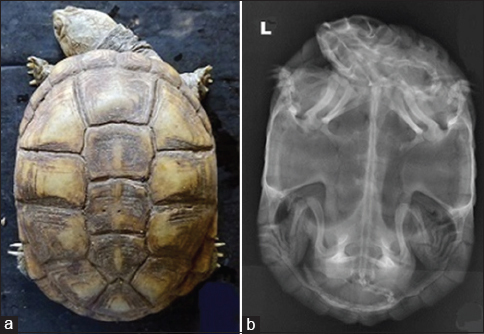 Our aim was to determine GI transit (GIT) time in Pelusios castaneus, a small sized group of freshwater pleurodira turtles that inhabit the tropics of West Africa. Materials and Methods: The study group comprised four males and four females with a mean weight of 0.81 ± 0.37 kg. Using a routine feeding technique, 10 ml of dilute barium sulfate suspension was administered orally and the GIT time of the contrast observed and monitored through radiography. The transit time was recorded in hours as it traveled through each section of the GIT. The time for complete contrast excretion was recorded for each turtle. Results: The contrast mean transit time from the mouth through the esophagus to the stomach was 1.06 ± 0.20 h and the mean onset of gastroduodenal transit was 4.05 ± 0.09 h while mean intestinal transit time was 245.90 ± 53 h. The mean total contrast excretion time was 10.8 ± 2.4 days. The female excretion time was shorter than the males (males: 13.7 ± 3.33 days; females: 7.8 ± 3.27 days), but this was not statistically significant. Our findings were at variance with results obtained among freshwater turtle species that inhabit temperate climates. Conclusion: These findings suggest an influence of turtles' natural habitat climatic conditions on their GIT time and possibly digestion. Objectives: The objectives of the study were to evaluate various sonographic findings in patients with clinically suspected acute appendicitis and its complications; to follow up and confirm sonographic findings by histopathological examination following surgery; and to determine the role of color Doppler sonography in acute appendicitis. Materials and Methods: One hundred patients clinically suspected to have acute appendicitis underwent ultrasound examination using high-resolution transducers; linear array transducers of 7.5–10 MHz and curvilinear transducer of 3.5–5 MHz. The presence of aperistaltic, noncompressible, blind-ended tubular structure with a diameter ≥6 mm in the right iliac fossa was the primary criterion for the diagnosis of acute appendicitis. Other findings such as the presence of appendicoliths, gas within the lumen of appendix, loculated collections, and appendicular phlegmon were also considered. Results: Out of 100 cases recruited for the study, 95 cases underwent surgical intervention in the form of immediate appendicectomy (89 patients), interval appendicectomy (four patients), or drainage of abscess (two patients). On histopathological/surgical correlation, true positive was 85, false positive – 1, true negative – 6, and false negative – 3. 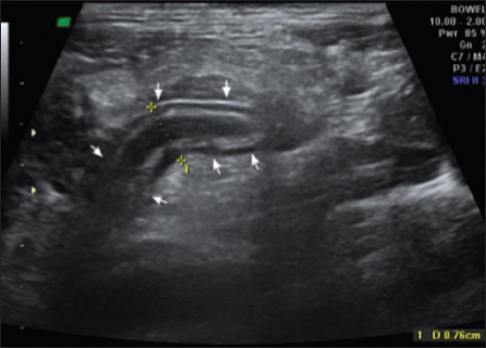 The observed sensitivity, specificity, positive predictive value, and negative predictive value of ultrasonography (US) in the diagnosis of acute appendicitis were 96.5%, 85.7%, 98.8%, and 66.7%, respectively, with an overall accuracy of 95.7%. In our study, 75% patients of appendicitis showed hyperemic color Doppler flow. Furthermore, the use of color and power Doppler sonography was more helpful in those patients where it was difficult technically to visualize the entire appendix. Conclusion: Grayscale US should be the first primary evaluation for patient suspicious of acute appendicitis, and color Doppler is an additional modality to increase sensitivity and more accuracy. Background and Objective: The optimization of patient protection in computed tomography (CT) requires the application of examination-specific protocols to ensure that the dose to each patient is as low as reasonably achievable. Appropriateness of a protocol reflects in the output of the volume CT dose index (CTDIvol) and dose-length product (DLP). This work aims to review and correct the likely weaknesses in default head CT protocols as a quality control measure. Materials and Methods: Departmental and Ethical Committee approvals were obtained. This retrospective study was undertaken between March and April 2016. The 75th percentile of the CTDIvoland DLP was calculated for 50 consecutive patients of both genders who were ≥18 years of age. On the CT console, radiographer (s)' manipulation of each of the ten common components of default protocols was scrutinized and compared with predetermined standard values from literature. Observed deviations necessitated appropriate interventional measures. A second calculation of the 75th percentile of CTDIvoland DLP was done for another group of 50 patients. Both pre- and post-interventional values were compared with the 60 mGy (CTDIvol) and 1050 mGy-cm (DLP) recommended by the European Commission. Results: The pre - interventional CTDIvol and DLP outputs were 65 mGy/1634 mGy-cm (Center A) and 86 mGy/1786 mGy-cm (Center B) whereas the post - interventional values were 58 mGy/986 mGy-cm (Center A) and 60 mGy/1030 mGy-cm (Center B), respectively. Weaknesses noted in protocols were excessive scan range (≥15 cm), <1 helical pitch, >1 s gantry rotation time, absence of gap, erratic manual mA manipulation, and neglect of prospective dose chart. Some posteroanterior scanograms were also wrongly acquired at an azimuth of 0° (anteroposterior). Conclusion: CT dose output in our locality could be compared to the values of the European Commission if meticulous and regular dose audit and correction is implemented. Facial asymmetry may originate from abnormalities of facial musculature, facial innervation, Lateral facial dysplasias or otomandibular dysostosis. We describe Magnetic Resonance Imaging findings of congenital unilateral hypoplasia in a teenager. 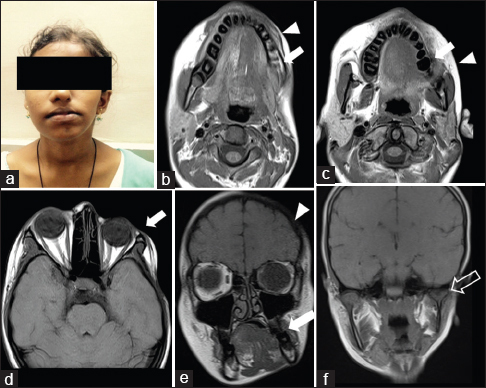 Case Report: A 15 Year old female referred from plastic surgery department for assessment of congenital unilateral asymmetry of face. Data included relevant history and physical examination and the basic diagnostic work up. The child presented with hypoplastic appearance of facial features on the left side compared to the right side. Asymmetry was more pronounced when she smiled and cried. On examination, the face appeared asymmetric at rest. The left hemiface appeared smaller and showed diffuse deficiency of soft tissue compared to the right side. However the overlying skin appeared normal. No neurological deficit was found in nervous system examination. Magnetic resonance imaging findings revealed diffuse reduction of the subcutaneous fat and muscle tissue on the left side. The left orbital, nasal, maxillary, mandibular bones showed hypoplasia. Muscle bulk was reduced on the left side with smaller submandibular and parotid salivary glands. Conclusions: Congenital unilateral hypoplasia of face is a rare anomaly that causes asymmetric of face. Pediatricians and otolaryngologists need to be cognizant of cardiac, head and neck, and central nervous system anomalies associated with congenital unilateral hypoplasia of face. The objective of the treatment is to restore facial symmetry and proper function. Teamwork is essential with a board of members including plastic surgeon, otolaryngologist, orthodontist and prosthodontist. Calcification of cephalhematomas is an uncommon complication of cephalhematoma in children. Larger size hematomas can cause cosmetic deformity, may lead to significant deformity of the inner table of skull and craniosynostosis which may require surgical intervention. 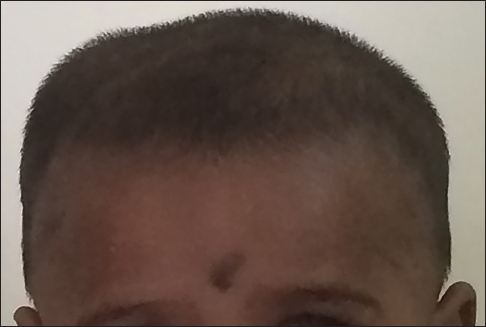 We present a case of a 1-year-old male child who presented with the history of scalp swelling over the right parietal region since birth. There were no neurological complaints or deficits. Computed tomographic scan of the brain showed an expansile lesion involving the right parietal bone. As the child was not symptomatic for the mass, we decided to follow him at regular intervals. Hepatic epithelioid hemangioendothelioma (HEHE) is a rare sarcoma of vascular origin. Massive hemoperitoneum (due to spontaneous rupture) and hematemesis (due to hemobilia) are rarer manifestations of HEHE. We present a 22-year-old male with 6 weeks' history of worsening noncolicky right hypochondrial and epigastric pain that later became generalized. Initial clinical diagnosis of perforated duodenal ulcer was made. Emergency exploratory laparotomy revealed multiple hepatic and intraperitoneal tumors with hemoperitoneum. Histology of the biopsied masses revealed HEHE. He subsequently developed massive hematemesis secondary to hemobilia (which was confirmed at endoscopy) from the HEHE. Contrast-enhanced computed tomography done on account of rapidly increasing hepatomegaly demonstrated multiple peripherally enhancing hepatic masses and peritoneal nodules with hemoperitoneum. He was placed on Avastin-based chemotherapy because of the vascular proliferating nature of the tumor. Despite relatively stable postoperative period, our patient had repeated episodes of massive hemobilia and finally died after one cycle of chemotherapy.